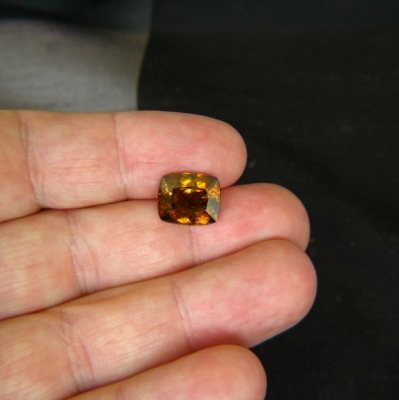 Comment: Massive, even more than 7 carat may suggest, deep brown and yellow sphene of the type commonly called titanite. 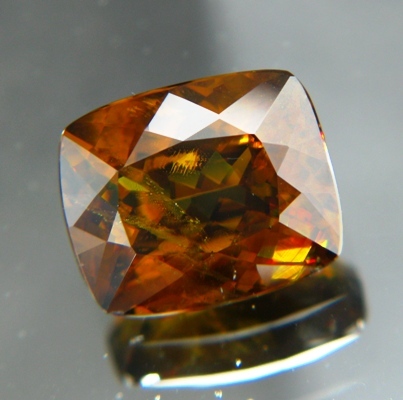 These gemstones have more luster than diamonds and have amazed the trade for a couple of years. Though a bit softer than others they can be set in pendants or earrings. This mysteriously dark gem is of rare size and yet made affordable by some just visible inclusions (big titanites are rarely clean). Never seizes to surprise in different lights, always ready for a sparkle even in dim light. Magic for candle dinners.